Images are a huge part of your sports facility’s marketing. They draw the reader in and project the energy of your brand in a way that words alone cannot. In the case of my facility, where families weren’t really sure what speed and agility training were, photos of athletes flipping tires and running through their drills took our prospective clients a long way toward understanding what we were all about. That’s why it’s unfortunate that I see SO many bad photos in sports facility marketing. Most of the photos I come across on sports facility web sites and emails are blurry, dark or not composed very well. Slightly-blurry photos might be fine for the occasional Facebook post, but they’re not OK for the banner on your homepage or on ads for your programs. Listen: I feel your pain. Any photographer will tell you that they prefer natural light — which is in short supply in most indoor facilities. Also complicating these shots is the fact that athletes are almost always moving — quickly — which makes it pretty tricky to get a clear shot without some serious equipment and expertise. However, there are ways to get great photos. Here are some ways that have worked for me and other facilities. A stock photo can be just fine for getting the point across and making your business look more professional than it would with a self-taken photo (or no photo at all). I’ve already mentioned some simple image editing programs that can really improve your marketing. Canva (the tool we use for the headers on this blog) sells stock images, for example. There are also some great free stock photography sites, such as Unsplash. I have paid for stock images on sites like Shutterstock before, as well. When I owned DNA Sports Center, it was home to a Parisi Speed School franchise location, too. As a franchise owner, I was given access to lots of stock photos of Parisi athletes, which was really helpful. This is probably the best option for getting photos if you can afford it. When a professional photographer comes out to your facility to take marketing images, you get great shots of your actual clients wearing branded apparel and showcasing your actual facility. This could be a bit pricey, but you can get creative and think in terms of a trade agreement with a photographer, as I mentioned in this post on creative sports facility partnerships. If any of your current athletes happen to have parents with photography skills, you could also try a trade with them. Just note that all photographers are not created equal: A great baby and family photographer may not be used to action photography, for example. I’m not a photography expert myself. However, I do know that videos often do a better job of illustrating exactly what’s going on in your training than photos. Plus, in video mode you don’t have to worry as much about blurriness or lighting. Of course, videos still can’t always take the place of great photos, such as for the main photo for your web site or the profile photo. However, they can be great alternatives in other cases, such as for social media posts. If you need a photo for a web page, you can insert a screenshot from the video (linked to the full video) or embed the video itself from a site like YouTube. Don’t expect great photos to happen organically — especially indoors in the evening. You have to plan ahead for better photos to happen. Before you take photos of live programming, get some practice shots in an empty facility to figure out your best angles. You can also experiment with finding the time of the day that has the best lighting. Empty facility daytime shots can be great for your web site because they make the space look bigger and can give an clear view of building features. Don’t forget to clean up and remove any distracting clutter before you get the shots. You have a lot going on with running a sports facility, and maybe you’re not trying to become an amateur photographer, too. But if you’re interested in the subject, a little bit of Googling could go a long way toward improving your photos (here’s just one article I found right away with suggestions on shutter speed and aperture). An investment in a tripod or a fancier camera (one that’s not your phone, for example), might end up being very worthwhile in the long run. There are also lots of opportunities for people to learn photography basics on sites like Skillshare and CreativeLive. I haven’t tried them myself, but if you’ll regularly need photos for your business and want to take them yourself, they might be a great option. Note that even if you’re not interested in photography personally, someone on your staff might really enjoy and appreciate the opportunity to learn more about it. In the meantime, I’d say that clear, focused photos of smiling kids are better than blurry attempts at action shots any day. Those may be a bit easier to take with your camera phone indoors. 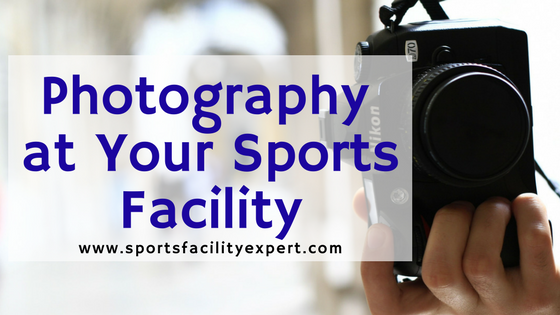 Which photography tips have worked for you at your indoor facility? Let us know in the comments.